Asics Gel Kayano 23 are stability cushioned running shoes. The supreme Asics Gel Kayano 23 is the reference for those runners looking for plush cushioning, stability and premium comfort for long distances despite high pricing. Current edition features the innovative FlyteFoam™ in response to other new foams from competing brands like EVERUN in Saucony Hurricane ISO 2 or Boost in Adidas Ultra Boost ST. Although every new foam promises lighter cushioning and improved response it is mandatory to wait for reviews from independent runners to quantify real performance. Major change compared to its predecessor Gel Kayano 22 is the mentioned FlyteFoam™ in the midsole for plush cushioning and soft touch. Rest of midsole keeps bouncy FluidRide® layer on top and well-known rear and forefoot Gel® cushioning system for responsive shock absorption on impact. In order to improve stability, midsole features specific pronation control technology (dual density Dynamic DuoMax®) in the internal side and typical plastic shank (Trusstic System®) in the midfoot for more stiffness. Outsole includes typical vertical flex groove (Guidance Line®) for smoother ride with minor changes in lug pattern and offers different rubber depending on the area with DuraSponge in the forefoot and AHAR+ in more exposed ones for increased durability. Upper has been simplified in the Kayano 23 with fewer FluidFit™ reinforcements over reengineered mesh for improved flexibility and superior comfort. 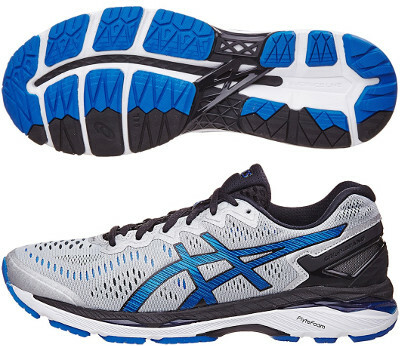 Classical Asics logo is fused to provide extra consistency while heel counter has been redesigned based on the one from its smaller sibling GT 2000 4. ComforDry X-40 not only enhances interior's dealing with odour and moisture but also increases comfort with softer feel. There is available a Lite Show™ edition with higher density of reflective elements from 3M® to improve visibility on low light conditions.